If you’re looking for an ethically sourced coffee in Stamford, then check out the guys at Aloha! The vibe at Aloha is ‘a culinary oasis of all things nutritious’. Founded by two brothers who both have a passion for healthy eating, Aloha is nestled in the buzzing town of Stamford and totally worth a look. Aloha’s menu is full of food made with locally sourced produce and is prepared fresh to order. Along with healthy and good for you meals, they offer a meal plan to suit every dietary requirement. These plans include meals, meal times, snacks and consultations to tailor around your busy life. You can also grab an ‘Aloha Box’ with a pick and mix style menu. First, choose your protein, then your base, then 2 sides and – Voila your awesome, healthy and nutritious meal is ready. The guys at Aloha have made a great name for themselves. Offering super tasty, fresh food, guilt-free snacks and awesome advice – Lucky old Stamford! …that’s where we come in. Grant and Nathan have chosen our Finca Florencia, Honduras coffee to serve through their espresso machine. The coffee at Aloha is roasted in small batches and delivered weekly to ensure they only serve the freshest coffee. All of our coffees are ethically sourced and the farmers are paid a premium price for their coffee beans. Therefore, the farmers are able to invest in next years crop, which in turn means better coffee year after year. Not only is their coffee ethically sourced, but it is speciality coffee and holds sweeter, smoother and more delicate flavours. So, is your mouth watering yet? Have a read of our page, What is Speciality Coffee, to find out more about how the coffee beans are sourced and what makes them special. So, next time you are looking for ethically sourced coffee in Stamford, go and say ‘Aloha’ to the guys. Grab a coffee, brunch, burrito or even a guilt-free snack if you would rather, to keep you clicking your coconuts all the way home. Want to know where else to grab a cup of Two Chimps Coffee? 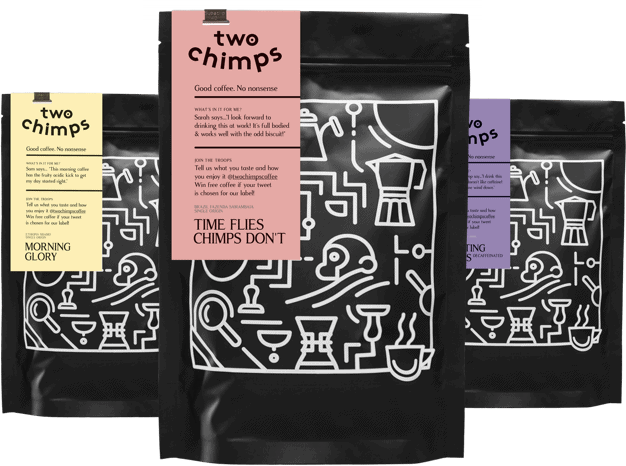 Find out on our ‘Where can I try Two Chimps Coffee page.